As most of you know, without proper research and knowledge, some hair extensions can be damaging to your natural hair. In some cases a person will end up with dry, broken and damaged hair after a few months of having extensions. The good news is that by doing a little more research and spending a little more money you can wear a full head of extensions with no damage to your natural hair. The following blog will give you the best options for non-damaging hair extension methods and what kind of hair to look for. 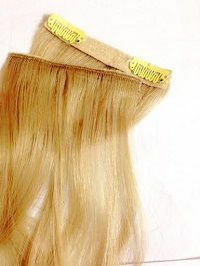 Clip In extensions are the safest method of hair extensions. Most of the damage from permanent extensions occurs from sleeping, washing and installation/ removal. If you don’t mind the process of putting them in and taking them out every day then this would be the best method for you. Also, clip in extensions made with good quality hair will last 1-2 years with proper care (washing once a week, deep conditioning and gentle brushing). A quality made set of clip in extensions will have felt lined wefts and strong clips so that you don’t need to back-comb your hair before installation. Tape in hair extensions are a great semi-permanent method of adding length and volume. Unlike traditional methods of extensions such as bonds, weaves and micro-beads, tapes are very light and gentle on your natural hair. Installation is fast and can be done at home with a simple You- Tube video tutorial and removal is 100% non-damaging if done correctly. The tapes can be removed using alcohol to detach the extension, which will then easily slide off your natural hair. Although new to the market, tape extensions have become extremely popular and are now one of the top selling methods of extensions. A set of tapes will last 4-6 weeks before needing to be moved up. There is no glue, clips, keratin or tight braids involved and the weight is evenly distributed over your head to avoid unnecessary hair loss. 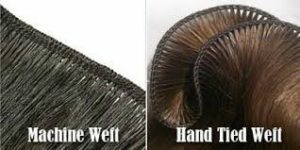 Weft hair is typically used to make a hair “weave”, which is when your natural hair is braided into a cornrow and then a weft of extension hair is then sewn into the cornrow. This is repeated in multiple rows until the desired thickness is achieved. Weaves are good for medium to thick hair and will instantly add lots of volume and length. They can be installed very fast and for very cheap. 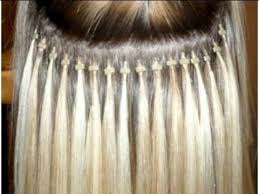 Weft hair is quite inexpensive compared to other new extension methods. It is very important not to use a weave if you have fine hair. If braids are made too tightly or the wefts too heavy they can hurt, put strain on your scalp or cause the hair to fall out from the root. A weave will also be very obvious on fine, flat hair as the braids take up a lot of your natural hair. There are many ways to install pre-bonded hair extensions. The two most popular ways are Micro Ring Hair Extension and Pre-Bonded Fusion Extensions. Micro Ring Extensions are secured with a metal ring which is threaded onto a small section of your natural hair. The I-Tip of the extension is inserted into the ring, which is then clamped shut using special pliers. 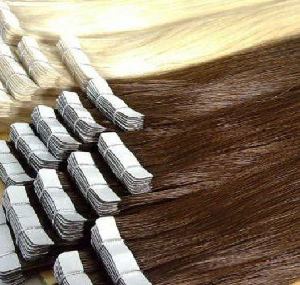 The pros of micro ring extensions is that they will last up to three months before needing to have them moved up and there is no glue or adhesive required for installation. You can blend many different colors and lengths and also position the hair to fall exactly in the direction of your natural hairline. 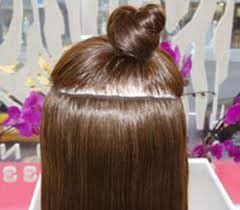 You can also wear your hair up in ponytails and many different hairstyles without seeing the bonds. For long term extensions, this is the most hassle free method. 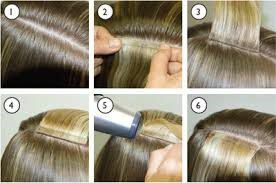 The drawback to micro ring extensions is that they will put a lot of strain on thin, dry or damaged hair. If not handled gently, there is a risk of shedding a lot of your natural hair. They must be removed properly by a professional or the removal process can cause a lot of damage. Be extra careful when brushing your hair and make sure you gently detangle between the bonds. If not properly maintained, or left in too long, the bonds may tangle and be very difficult to brush out. If you are looking for long term extensions and don’t mind taking a little extra care then micro rings might be for you. 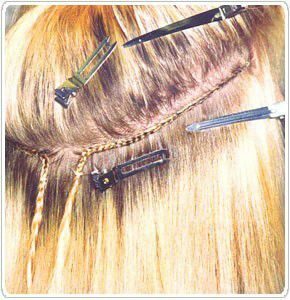 U-Tip and V-Tip Extensions are also applied strand by stand but instead of using metal clamps to secure the hair, the tip is heated and moulded onto the hair at the root. These types of extensions are losing popularity as the removal process can be very damaging and the bonds tend to stick together and tangle very easily.